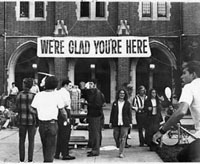 The 40th anniversary of coeducation at the University of Notre Dame. The 40th anniversary of coeducation at the University of Notre Dame will be celebrated in a panel discussion, Paving the Way: Reflections on the Early Years of Coeducation at Notre Dame, at 7:30 p.m. on Thursday, November 8 in the auditorium of the Eck Visitors Center. The discussion, sponsored by Notre Dame’s Cushwa Center for the Study of American Catholicism with the Department of American Studies, the Gender Studies Program and Badin Hall, will include five people who experienced and shaped Notre Dame’s transition from an exclusively male to coeducational institution. Jeanine Sterling, senior analyst for a global research and consulting firm, also a member of Notre Dame’s first coed freshman class and now a member of the Notre Dame Alumni Association’s ND Women Connect steering committee. Originally published at newsinfo.nd.edu on October 31, 2012.